This long-lasting all natural lip balm soothes, nurtures and protects lips in need of deeply moisturized comfort. Weleda Everon Lip Balm is a luxurious and nourishing treatment that leaves your lips soft and supple with a healthy shine and the delicate scent of vanilla and roses. Give your lips a treat with this all natural lip balm. Soothing and nourishing organic jojoba seed oil in Weleda Everon Lip Balm embraces your lips, absorbing deeply to eliminate dryness for a healthy, nourished smile. Organic shea butter is an effective, skin-smoothing emollient that renders your lips palpably softer when you use this all natural lip balm. Beeswax in Weleda Everon Lip Balm provides long-lasting protection for your delicate lips from skin-damaging environmental influences, while rose wax cares for cracks and irritations with its natural antiseptic properties. With healthy, nourished moisture and protection ensured, you’re left with comfortable, kissable lips that have a beautiful reason to smile. 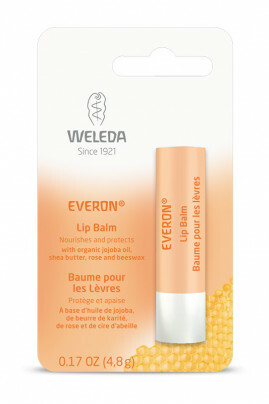 Apply Weleda Everon Lip Balm to your lips as often as needed. This Balm can be used as a lipstick primer. Simmondsia Chinensis (Jojoba) Seed Oil, Beeswax (Cera Flava), Butyrospermum Parkii (Shea Butter), Euphorbia Cerifera (Candelilla) Wax, Rosa Damascena (Rose) Flower Wax, Copernicia Cerifera (Carnauba) Wax, Vanilla Planifolia Fruit Extract, Rosa Damascena (Rose) Extract, Citronellol*, Benzyl Alcohol*, Geraniol*, Eugenol*, Farnesol*.